Now that the boys are older, Christmas morning doesn't come so fast around here so I'm just waiting for people to wake up while I check the weather. The big news around here is the snow and we're supposed to be visiting relatives soon, so I want to travel at the safest time. It looks like we're going to get lucky and have an open window. Snow and winter weather provides great opportunity for scouts to do some good turns over their holiday break from school. Our troop doesn't meet as a troop over break, but I encourage the patrols to get together on their own for something fun and/or service-oriented. Individual scouts can easily see if driveways and sidewalks of their neighbors have been cleared. If not, they can offer to do it. Maybe their dad or little brother can be their buddy and help out too. Scouts should know if they have elderly neighbors. If they do any door-to-door fundraising, or just through exploring their neighborhood, they should remember who lives where. Offering to pick up mail, take garbage cans to the curb, take a pet for a walk, or help with other errands can be a big help in slippery conditions. Fire hydrants should be kept clear of snow. Many people don't realize this responsibility. A great service project for a patrol is to canvas a neighborhood, clearing fire hydrants after asking the homeowner for permission. The same is true for groups of mailboxes and entries to sidewalks - it helps to have the snow cleared away, but people often forget. Snow provides many opportunities to help others. A scout providing assistance without pay or reward is being helpful and kind, and hopefully also cheerful since it's such fun getting out in the snow! Cub Scouts 2010 - if you're a Cub Scout leader, you really should check this out. It is a new step in the evolution of the Cub Scouting program that's been tested the last few years, resulting in huge increases in retention of scouts. It's still early, but Cubmasters and den leaders should start planning on how their pack will implement this new program for the 2010-2011 school year. Why don't we have a sewing merit badge? There should be a skateboarding merit badge. When will we have a hunting merit badge? Have you ever had or heard similar questions? 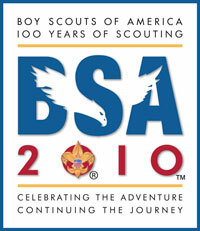 Well, BSA has posted an email address where you can start the process of creating a new merit badge. Proposals that fit merit-badge criteria and rank highly with youth members are sent to a volunteer task force and the Program Content Committee for review and development. Our lottery submission for a 2011 Philmont trek wasn't a winner. :-( Got a rejection email yesterday, saying we're on the waitlist, so it's a gloomy day. We had two crews worth of people ready to go. I hope some of you had better luck - let me know. I sure hope the opening of The Summit in WV has a significant effect on availability of treks in the coming years. I'll be listening in with you to hear Chief Scout Executive Bob Mazzuca, National President John Gottschalk, and National Commissioner Tico Perez. So, have you seen it? How was it? Scout Camp the movie - from the trailer and videos looks like an interesing comedy about Boy Scout summer camp - another angle on the usual "underdog group vs. popular group" theme. Due to the comments contributed to my previous post, I'm curious what people mean when they say "Eagle Factory". So, what is it? I could find just a couple troops that refer to themselves as eagle factories on the 'net, with the general meaning that they have a focus of 'directing' scouts to eagle rank. I could find hundreds of instances of troops and scouts posting that they are not eagle factories or a product of one. But, I could find very few descriptions of what an eagle factory is. I expect everyone has their own definition, very few of them positive. I just figured our troop's percentage from data in Troopmaster and it looks like almost 40% of all scouts that joined from 2002-2005 will make it to Eagle. I imagine that just that number will cause some readers to say "eagle factory". But, it would be interesting to hear from you what characteristics an eagle factory troop has. Andy Anderson - An Eagle Factory troop has a routine program that "processes" boys to get Eagle. The boy only needs to show up, do what is asked of him, and he gets Eagle. Boys from these troops can achieve Eagle at age 14. Bob McCown - Its mostly an Eagle factory to get 'Eagle Scout' on college applications. Merit badge classes are a rubber-stamp joke, for the most part, and the whole "Scout Spirit" bit is shown just by showing up, not actually being a 'good scout'. Troop 20 - an Eagle factory, with its sole focus on obtaining Eagle. Guy Noir - the scout troop that�s an Eagle factory, focused on numbers but not the participants. Scouting Magazine - a 1995 article. 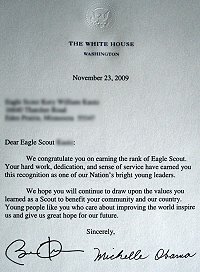 On December 11, 2008, my son completed his Eagle Board of Review. Oh, happy day! 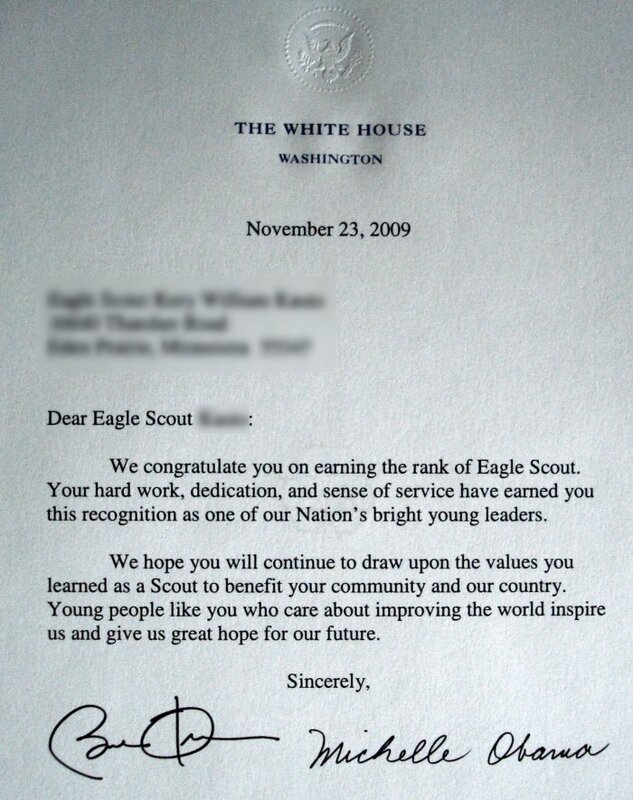 At that time, he was a little concerned that his paperwork would get done too soon and he would receive a congratulation letter from the current president rather than the incoming president. He even asked if the paperwork could be held up a couple weeks, just to make sure. Yesterday, his letter from the White House arrived - it took about 333 days so I guess somewhere along the line someone listened and held up the paperwork. You can click the small image of the letter to see a bigger version if you want. Now, almost a year later, I heard last night at our roundtable that the council may turn out another record number of Eagles, beating the record set last year. Our troop did its part I figure, with having five scouts reach Eagle and one more having his scoutmaster conference with me next week.